Hakodate Birding: A hard rain fell. It was a grey drizzly day. The weather has been just awful in the second half of August. Very heavy and frequent rain has filled the rivers and they have dumped all sorts onto the local beaches.............sediment and trees mainly. 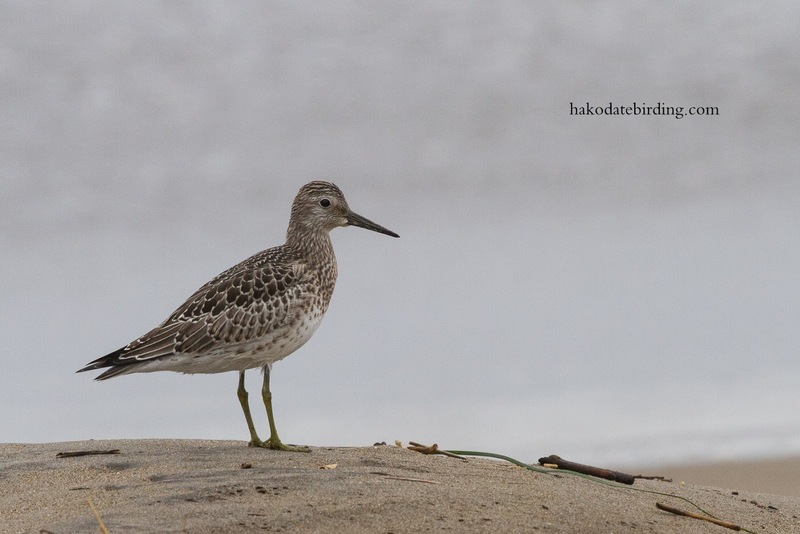 Not so many waders around this year, so far at least. 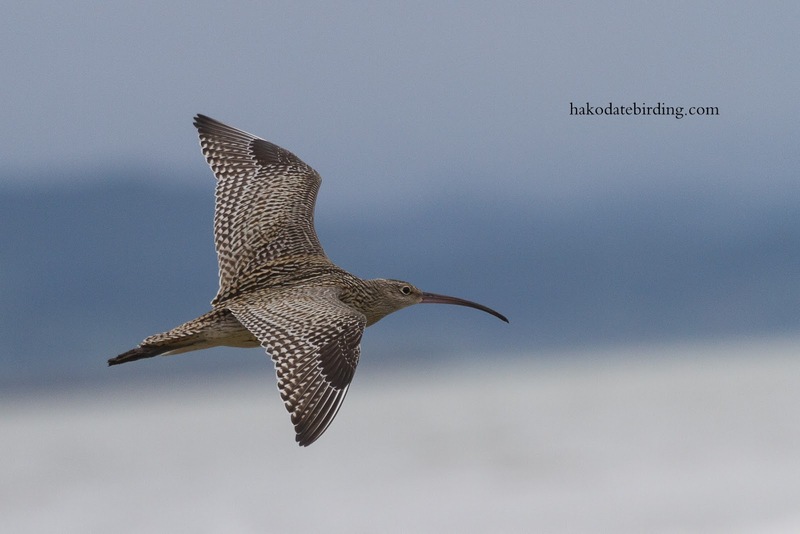 Today was the end of a 4 day break for me and theere have been almost no waders around at all near Hakodate. 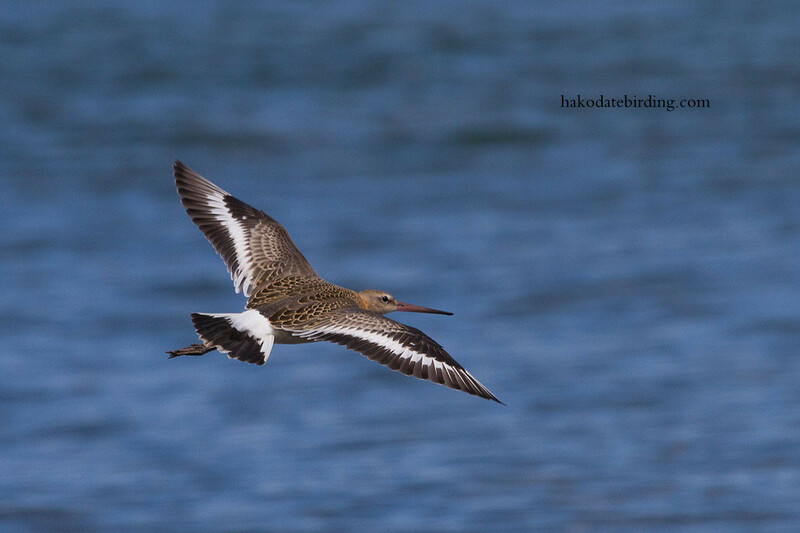 At Yakumo there were 2 Bar Tailed Godwit, 1 Terek Sandpiper and 2 Common Sandpiper. Last week saw another Curlew, some Grey Tailed Tattler, Red Necked Stint and this Black Tailed Godwit. 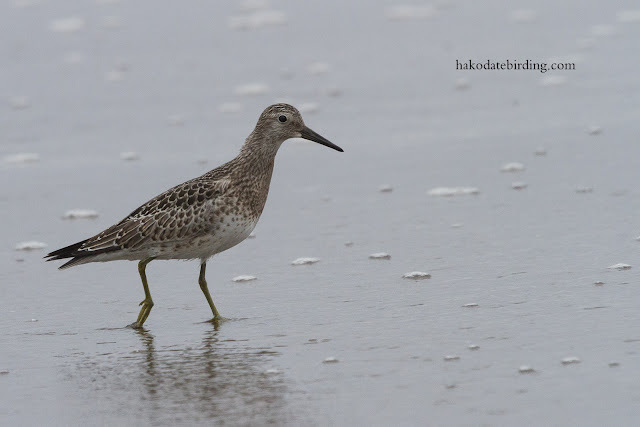 At Oshamanbe theer were more Red Necked Stint today and 1 Great Knot. This was a grisly find on the beach at Oshamanbe. 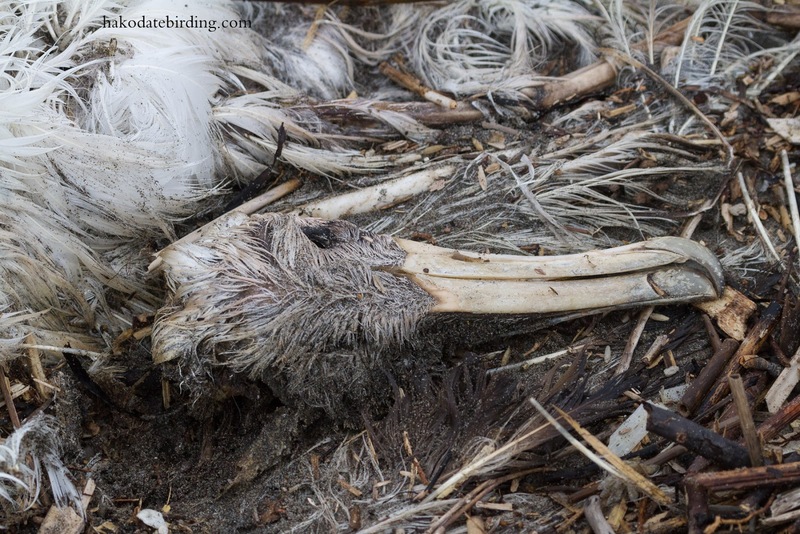 Some kind of albatross I think. Laysan? Short Tailed? 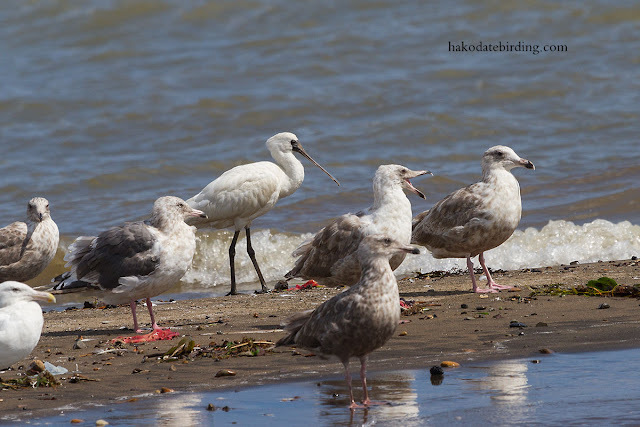 It was partially buried in the sand and I let it be (maybe I could have looked to see if it had been ringed or tagged). 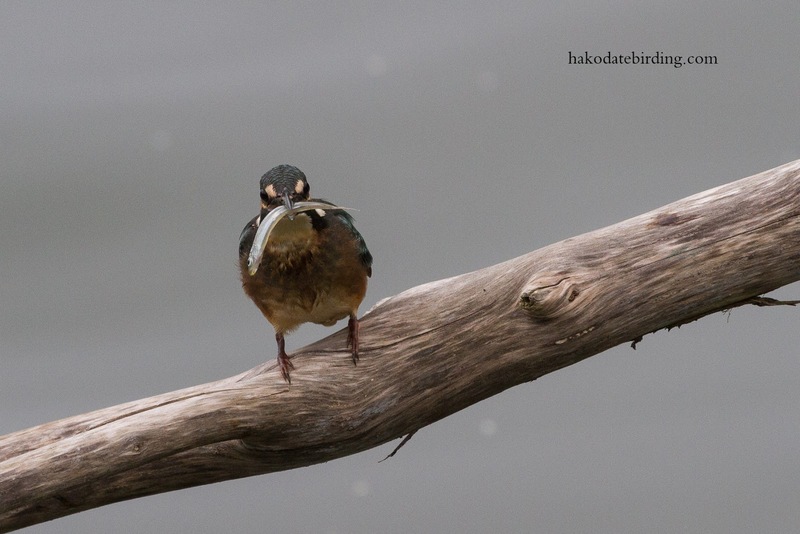 This Kingfisher was at Yakumo. So a pretty quiet last couple of weeks photo wise at least. There have been a few birds around. 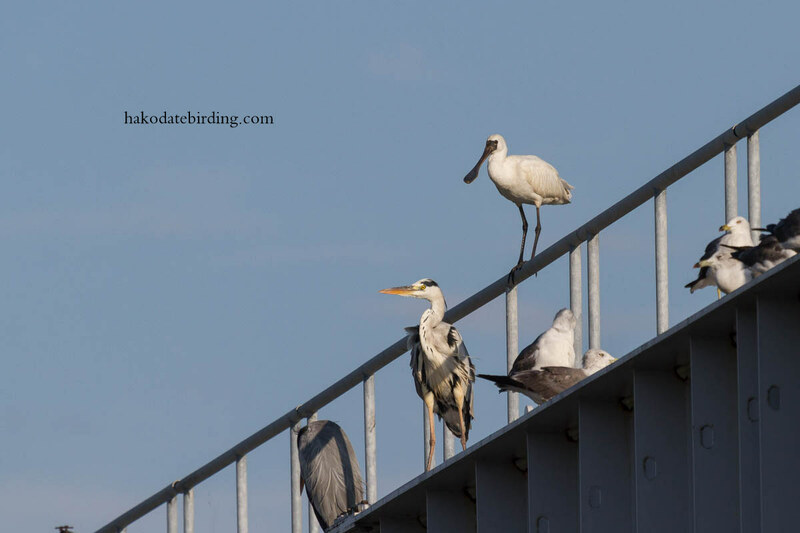 Returning Black Headed and Glaucous Winged Gulls from the north, Great Egret, lots of Japanese Green Pigeon at many locations on the coast, a Sand Martin colony at Oshamanbe (a bit late but I hope it is still there in 2014). various raptors including Peregrine, Goshawk, Eastern Marsh Harrier and the inevitable Ospreys. The Black Faced Spoonbill hung around for a week or so but I couldn't get close to it again. So not a great end to my short holiday. To top it off I trod in some dogs**t and lost a lens cap. After England retaining the Ashes and everything rosy in the world of cricket let's hope my footy teams pull their fingers out. Let's start with Liverpool beating Man U today and England not f***ing it up against Ukraine next week. 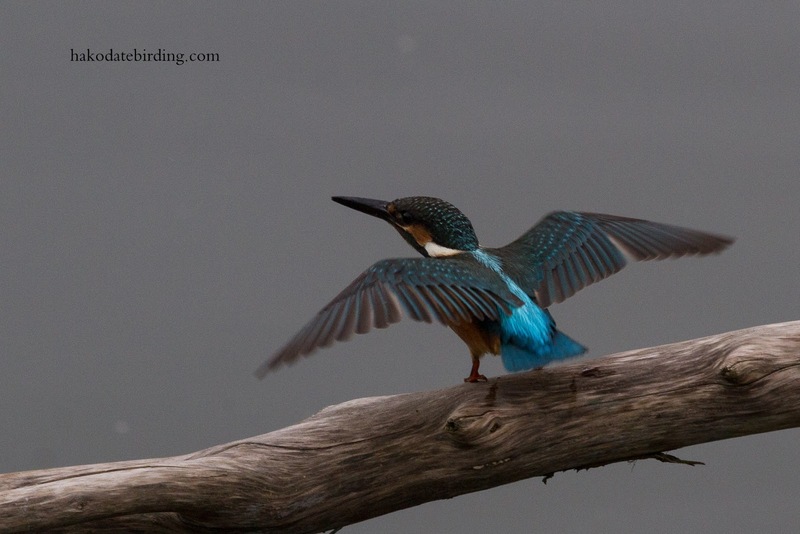 The weather may have been awful, but you've had some great birds, even if they were few in number. I like the one of the Kingfisher with its wings spread. Their colours are stunning when the light catches them. Brilliant photography, lovely bird species, sad to see the Albatross..... nature I guess. Hi Dave, yes I said to the wife Oshamanbe would be a depressing place to die. I hope it died peacefully on the sea dreaming of all the squid it had eaten across the vastness of the Pacific........rather than thinking why it had ended up on a squalid little stretch of beach in north Japan. Some excellent pictures, Stuart. Really like the flight shots. I went in search of waders today but can't access the area because it's fenced off. I don't know how anyone can get close to waders anyhow -fence or no fence. I'm sure you can find them Russell.............although the wader passage up here has been rather light this year. Superb photography as per usual. 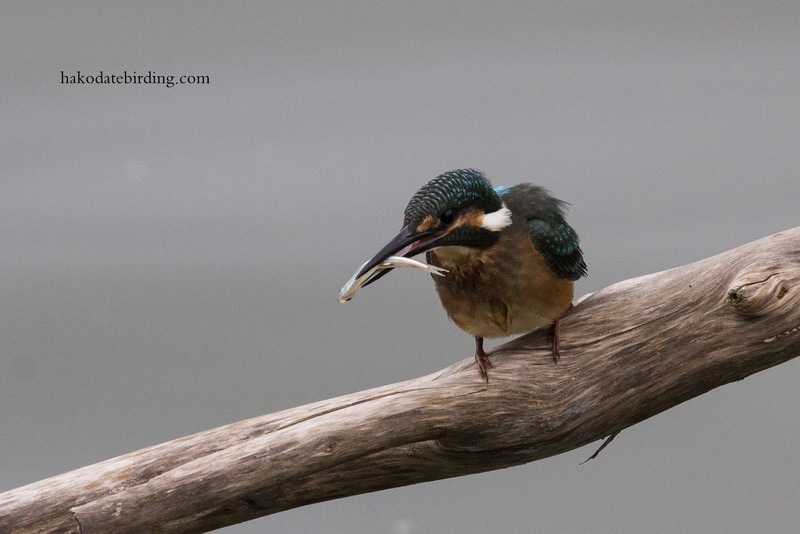 The Curlew and Kingfisher captures are fabulous. Nice BIFs as ever and I really like the KF with its wings open + weird to see a Spoonbill standing on a metal fence. 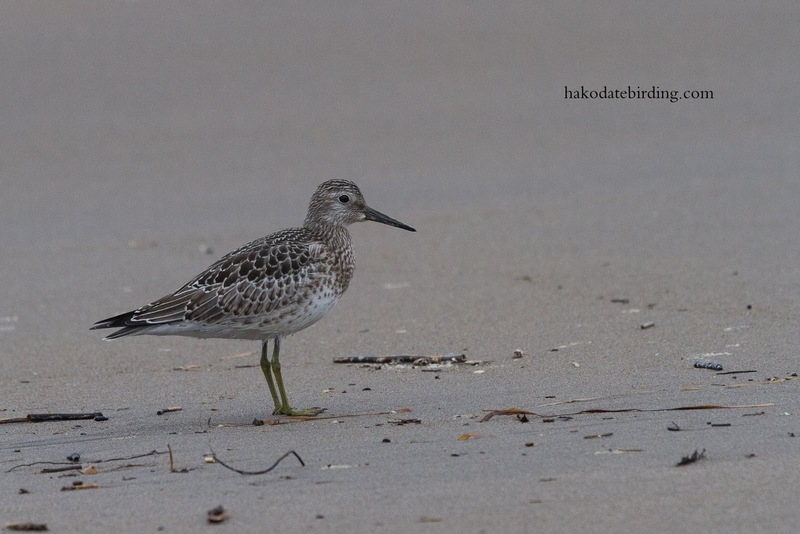 We have had a mini waderfest here with decent numbers of L Stints and Curlew Sands as well as a good run of Wood Sands. 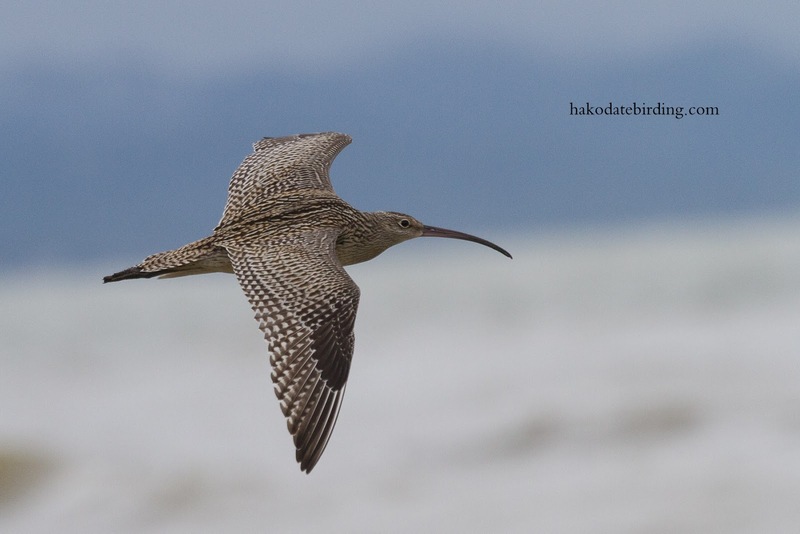 There are strong westerlies just now which have dropped in some N American waders e.g. Stilt Sand in NW England. Hi Stuart, actually NW England seems to get a lot more raities than it did in my day. Is that a change in bird habits or better observation? The latter I suspect. Hi Margaret. Thanks for the comment. 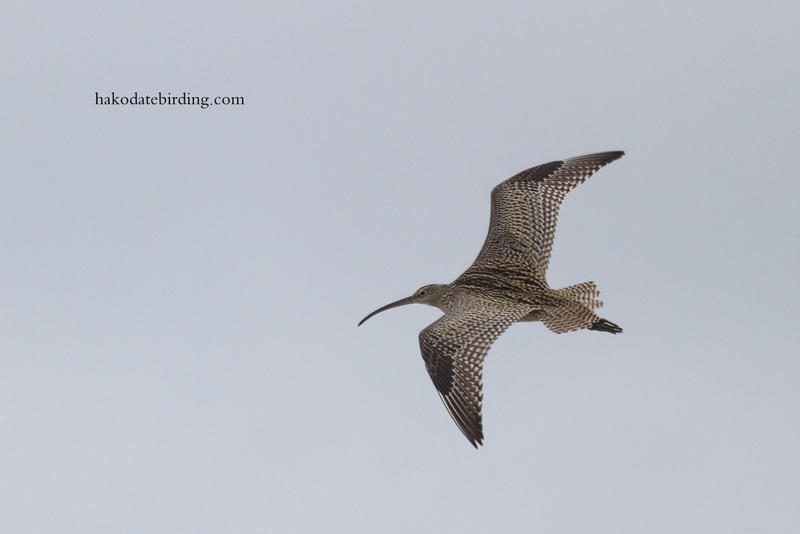 Nice to see Eastern Curlew in your area, too ! AND Liverpool beat Man Utd. ! Yes, the weather may have been crap but your pictures aren't. 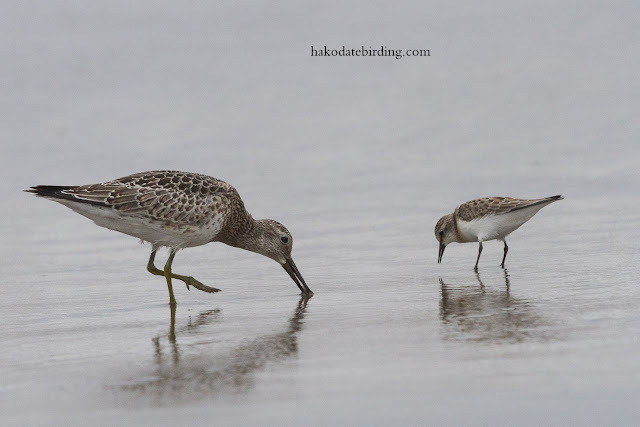 if only i could get wader pics like those. By the way I love mushy peas, and chick peas and green beans. All good fuel as they say. Hi Phil, good fuel maybe but what about the emissions????? Very nice collection as usual, Stu! 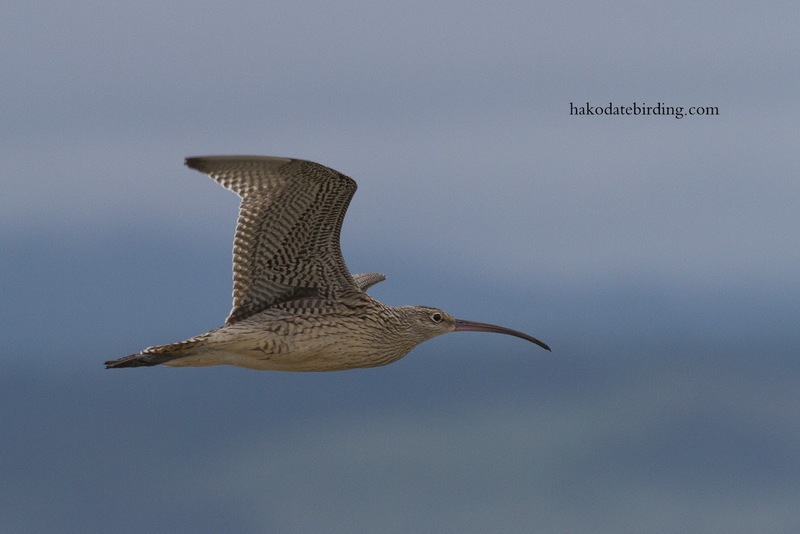 The curlew is a juvenile bird, that's why it has shorter bill.